Acer has launched the Liquid Mini, a tiny Android phone that comes in a range of different colours. The Acer Liquid Mini is essentially a smaller version of the original Acer Liquid Android phone, with similar styling but a smaller form factor. "The subtle curves of Liquid Mini meet the beautiful chrome edges, wrapped in a soft touch casing shaped to fit your hand perfectly," reads Acer's lovingly crafted press release. "You will be amazed to discover so many features in this charming Android smartphone." It also comes in loads of different colours, for the fashion-conscious Android fans out there, including blue, silver, black, green and pink. 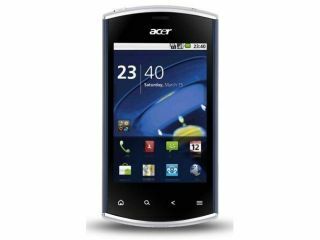 The Acer Liquid Mini runs on Android 2.2, and features a diminutive 3.2-inch capacitive screen with multi-touch input and Wi-Fi and 3G support to keep you connected. Additionally, there's a GPS and you can also stream music and video to a DNLA-certified TV from the device. There's only 512MB in-built memory, but you can beef it up with a microSD if you want to store loads of tunes or movies on the phone. No pricing details in from Acer as yet, though we do know that the Acer Liquid Mini will be available in the UK from April.